So you’ve read through our “Learn the Jargon” post from last month but you’re still hungry for a little more. Well this week we’re bringing you another round of green energy knowledge to help you become a leader in the field of renewables. As you know, solar plays a major role in the renewables sector, both in the middle east and around the world, but despite its prominence many people don’t understand the different setups and configurations that are available. To help address this issue we’ve put together four simple and useful diagrams to help you understand each type of solar setup, their benefits and weaknesses, and where they are most commonly implemented. A standalone photovoltaic power system is one that is completely independent of the utility grid where all power generated is used at the consumption point. These systems represent one of the simplest photovoltaic setups available and are often the cheapest solutions. However, as these systems do not implement any power storage options, they are often limited to very specific applications. A standalone system like the one above will only be active during daylight hours and may be susceptible to environmental factors such as extended cloud cover. A grid tied PV system leverages much of the same technology used in a standalone system but rather than producing power in isolation, these systems work with the utility grid and feedback any excess production. They utilize an extra piece of hardware called an energy meter to monitor net consumption (or production) and provide much more reliability than simple standalone setups. This added security does come with additional costs however and depending on your location you will need to be prepared to pay for the metering, the meter, and any connection fees charged by the utility companies. 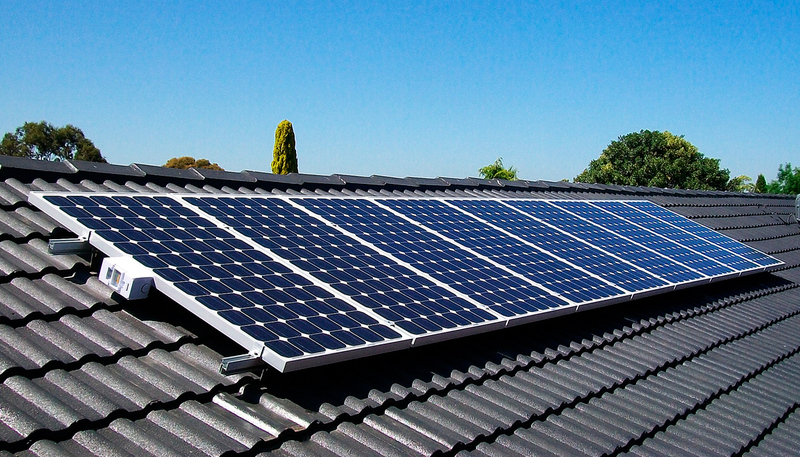 With all that considered, this type of system is the most common setup for residential homes and for many it provides the right balance of renewable and reliable. This system follows the same independent structure as the simple standalone setup but adds a battery bank to help stabilize the power for the end consumer. While it may seem like a very small change, the addition of a battery bank means that excess power can be stored and the overall system can remain functional at times where there is minimal or even no sunlight. While far more reliable than a simple standalone system, the addition of a battery bank will not provide the same reliability as a grid tied solution. The system will be depleted after several days of low sunlight and without grid support consumers might find themselves with insufficient power for their demands. The hybrid system combines elements from each of the previous systems to provide the most reliable and feature packed system. The hybrid system takes the concept of battery backup and combines it with the stability of a grid connection. The battery pack again helps to stabilize the power for the end consumer, but in the context of a grid connection, this stabilizing role provides a major advantage over all other systems discussed so far. It allows the consumer to choose when they consume renewable energy and when they consume grid based power. This means that a consumer can purchase grid power when it is cheapest and switch to renewables when it is the most expensive. Still have some questions? Reach out to us in the comments below or at info@powergreen.com and we’ll make sure we get you the information you need. And if you’re not already, be sure to follow us on Facebook or Twitter, or subscribe to our newsletter to make sure you never miss a post.